What the heck are you doing going to the Div. 4 website for info on the Worlds? 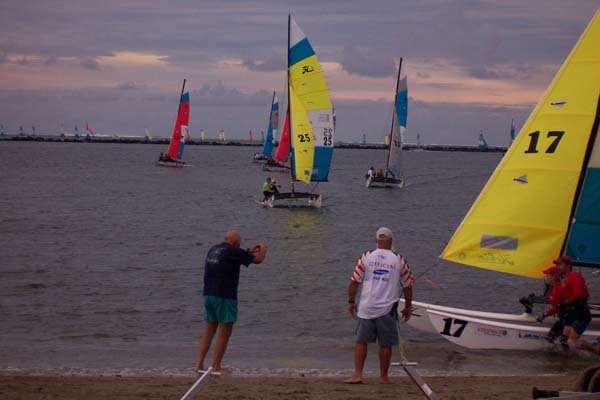 You should be on the Hobie Community Forum or CatSailor. Oh well, you are here now!!! Post subject: Ever pull a BULLET against the rest of the WORLD? Hey everyone, I sail in a fleet with a team that on Oct 9-17th beat the world. Peter Nelson/Laura Sullivan first place on the 4th race!!!! Our Northwest Team in play. the last day of the semi finals, with 56 teams from this round going through to the finals. It looks like Peter and Laura finished #48 by pulling out a 3rd place in the last race! There's our team. Looks like Jerry doesn't want to get his feet wet.